Welcome to the Jumanji jungle. It’s got fun and games. It’s got everything you want, honey — including some high-wattage names. Happy holidays, everyone (you too, Guns N’ Roses): Dwayne Johnson, Kevin Hart and Jack Black all bring the funny in a zany and surprisingly inspired sequel of sorts to the $100-million Robin Williams blockbuster. Perhaps this pic isn’t as anticipated as the one with Luke Skywalker and Leia Organa — what, you didn’t have a little Alan Parrish action figure back in the day? — but it’s primed to be a fun-for-the-whole-family crowd pleaser. 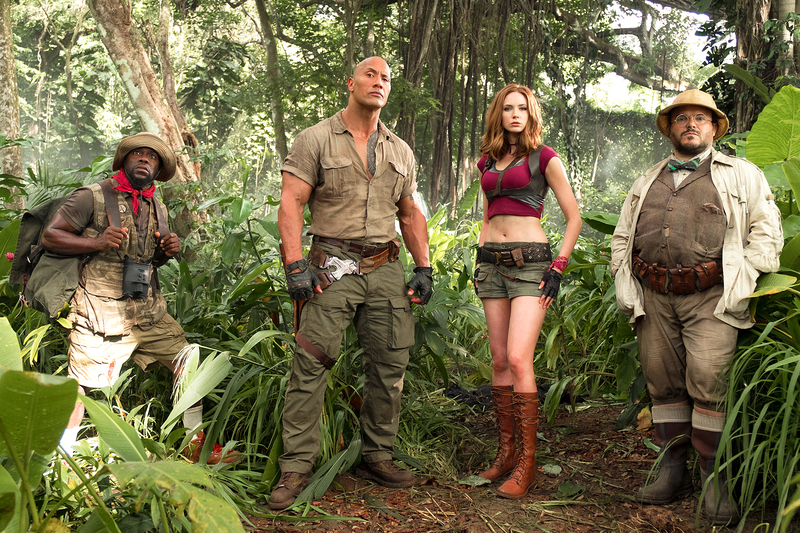 Kevin Hart, Dwayne Johnson, Karen Gillan and Jack Black in ‘Jumanji: Welcome To The Jungle.’ SONY PICTURES ENTERTAINMENT INC.
A long time ago in a galaxy far, far away (read: the suburbs in 1995), audiences clamored for the story of a boy that got trapped inside a mystical board game called Jumanji then released back in the real world three decades later, bringing all the rampaging animals with him. Alas, board games have gone the way of Smash Mouth CDs. This is a follow-up 22 years in the making. There better be a cool story upgrade. There is. The new adventure features bored teens — popular, pretty, Instagram-obsessed princess Bethany, loner misfit Martha, football star Anthony, and nerdy, friendless gamer Spencer —stuck in detention for the afternoon. Before they can write their letter to Mr. Vernon explaining exactly who they are, they discover a vintage Jumanji video game console. Boom! They’re suddenly transported into the wild setting of the game. If they’re going to survive the elements, defeat the bad guy (Bobby Cannavale), and return to the real world unscathed, they must do so as their unlikely three-dimensional avatars. Spencer is now a buff explorer (Johnson); Bethany is a cartographer (Black); Anthony is a zoologist (Hart); and Martha is a dancing commando warrior (Karen Neris, Nebula in Guardians of the Galaxy). The out-of-body realizations alone are amusing delights. A horrified Black, for example, exclaims at the top of his lungs, “I’ve turned into a fat middle-aged man!” Because of the gender-switch, the actor has the most comedic heavy lifting to do, and he shows impressive strength channeling a bratty millennial. On a laughs-per-minute scale, the role is a step up from running around a jungle in a half-naked drug haze in 2008’s Tropic Thunder. Karen Gillan in ‘Jumanji: Welcome To The Jungle.’ SONY PICTURES ENTERTAINMENT INC.
Johnson and Hart, costars in 2016’s Central Intelligence, generate laughs as well lampooning their onscreen personas. Face it: The only way for Johnson to not behave like a self-aware swaggering action hero at this point is if, on the inside, he’s really an insecure, wispy doormat of a teen boy. Nicely played. To enjoy a broadly appealing movie, it’s not necessary for the actors to look like they’re having fun on screen. On the contrary, some of the lamest comedies in history seem to exist just because a group of pals wanted to hang together in a sweet location. (Cough, Ocean’s Twelve, cough, Just Go With It, cough, Grown Ups, cough, The Interview.) In Jumanji: Welcome to the Jungle, the genuine camaraderie helps big time. During the more restless moments — each player can “die” in the game up to three times, do the math — the actors liven things up with their manic energy. And don’t look past Neris, who takes over two scenes doing a jungle boogie. But for the most part, the game play zips along thanks to clever G-rated laughs and nifty adventure sequences. There’s also a touching moment that acknowledges and pays tribute to Williams’ Alan character, making Jumanji: Welcome to the Jungle the antithesis of a true franchise reboot. (Just don’t expect Kirsten Dunst or any other actors from the original to pop up.) It’s all pleasantly silly, but not commercially crass or wink-wink tawdry. Indeed, a big-budget follow-up that doesn’t unreel like a lazy money grab is a victory in of itself. Everybody wins! Jumanji: Welcome to the Jungle opens in theaters everywhere on Wednesday, December 20.